Since typewriters were generally saved by many families even after they became obsolete, it's very common for someone to inherit a typewriter that they would like to sell. Luckily for you, if you are one of those people, you should keep in mind that typewriters are NOT worthless nowadays, and can actually be worth much more than you thought. ​ There are many exceptions and factors that play into how much you can sell your typewriter for, though, so I encourage you to keep reading! If your typewriter has been sitting somewhere where it's been exposed to the elements and abuse for many years, and it's seized up and caked in rust inside and out, your typewriter obviously isn't worth a lot of money. In fact, you may even struggle to give it away depending on the model and how bad it really is. The most desirable typewriters are generally in good shape in all areas, cosmetically and mechanically. Good cosmetic condition means there's minimal issues with the paint, including paint loss/chipping, fading, discoloring, scratches, etc, the labels are completely in tact and not too faded, the silver plating or chrome isn't pitted or rusty, and the platen and/or other rubber parts aren't cracked or chipped. ​I highly recommend, as the seller, to actually test all the functions and take note of what works and what may not work. Even if it needs a new ribbon, you can still fully test everything just as if the ribbon was brand new. Sure, the letters won't print, but they should all make the same solid impression on the paper. Sticky keys don't require major repair (usually just some cleaning) however if a typebar does not respond to a keystroke, then that's a bigger issue which absolutely must be noted to potential buyers. Another common issue is a broken drawband, or carriage string. Hopefully you get my point- even though the ribbon is dry and nothing is being printed on paper, you can still feed a piece of paper through the platen and test everything anyways. Typewriters that are sold "as-is" and untested are seen as risky to most buyers, because it isn't known if any repairs will be needed, and to what extent and cost those repairs will demand. I understand that many sellers who don't have experience with typewriters have no idea how to really test a typewriter, but it's seriously worth learning how to use the typewriter and to check if all the functions are working properly. The price you will actually get by doing this will reflect how important this is- Don't be lazy! Also, please do not advertise your typewriter as "mint condition" unless it is actually flawless in pretty much every way, shape, and form. This is extremely uncommon, and typewriters that are in true mint condition demand significantly higher than those even in "near mint condition." Also, make sure to point out any cosmetic or mechanical issues the typewriter has. Be honest- the buyer has the right to know what exactly they are getting. You can also feel free to brag about anything the typewriter has going for it, but do not use this to bump up the price too much unless it's actually justified. Create a complete and thorough listing or advertisement. This is pretty self explanatory, overall, but after all you are trying to get someone to buy your typewriter for the price you are asking. If you cut corners and spend minimal time on your listing or ad, you will not be able to get as much money as you could have by making a more thorough and complete listing. This is rather obvious, but it's key to include the typewriter's make and model in the listing. Most of the time the make and model are blatantly written on the typewriter itself, but in some cases in may not be, especially with American depression era machines. If you have any questions on the make or model, either contact me, or do some research online. Thanks to the typewriter database, it's rather easy to find the exact year which your typewriter was manufactured, and possibly some additional information (you can see how long your model was produced in many cases as well). Not every typewriter is included on the database, but most makes/models are on there. Knowing the year your typewriter was made is not exactly as key as some of the other things I have on this page, however it can add some historical significance and background to the typewriter. In terms of pictures, expectations aren't too high, but at least use a decent phone camera (make sure the lens is clean of fingerprints/dust) and put the typewriter under some decent lighting, color-neutral and natural preferred. If you really want to look super professional, you can put the typewriter in front of a nice background. The most important point with the photography element of the listing is to capture many different angles of the typewriter. Especially if the buyer will not be seeing the typewriter until after they have paid and it comes in the mail. Just think, someone out there will be making a decision to buy or not to buy your typewriter based on what they see. The more they see, the more confident they will be in bidding or buying the typewriter. If you only upload a few poor-quality photos from a similar vantage point, a lot can be hidden- especially with these rather intricate machines, and buyers know that. Additionally, a quick google search can reveal quite a few interesting facts about your model of typewriter. There are several sites and blogs packed with excellent information about many different makes and models of typewriters. 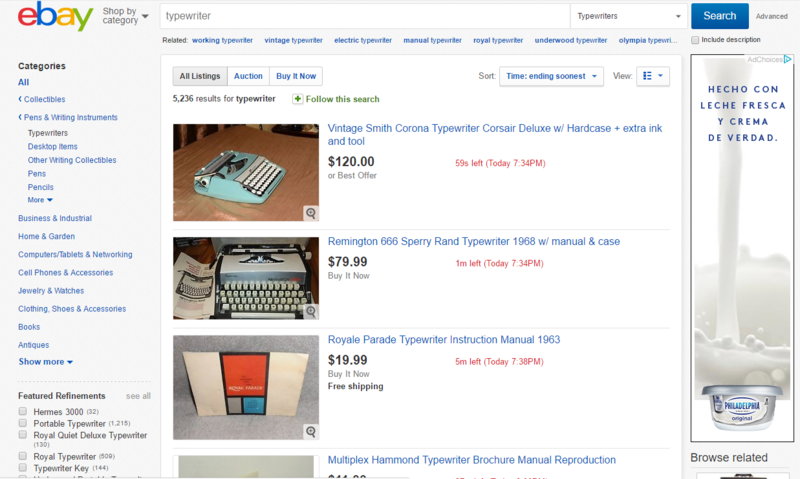 Just type in the make and model into your search-bar and you'll likely be impressed with what you can learn about your typewriter, and pass on to the buyer or potential buyers. A little cleaning can go a long way in making your typewriter stand out from the rest. Unless your typewriter was kept covered and in the right environment, your typewriter may already be pretty clean and in good shape. Maybe all it really needs is a new ribbon and some oil. However many typewriters have been sitting in the open for extended periods of time, and can be covered in dust and grime both inside and out. It's not always necessary to clean the thing out thoroughly and do a complete service job (unless you are knowledgeable and experienced in doing so) however it truly does help to give it a light cleaning and wipe down. A lot of times there may be a very light and thin layer of grime and dust which can either fade or discolor the paint finish and any chrome or nickel plating. In many cases, it only takes a few minutes to get rid of this layer, exposing the true and original surface, which is much more beautiful and makes your machine look ten times better than it would have before. ​For paint, this can be done with a damp cloth (soap and water) and then wiping the surface dry with another cloth. Be careful and avoid labels which can easily be rubbed off when wet. For metal, you can use a harsher solution. Rubbing alcohol really does the job well in many cases, and is my preferred solution for getting that layer of grime off chrome or nickel plating. Just use a cloth damp with rubbing alcohol and rub the metal you are looking to shine up. Do not get any rubbing alcohol on the paint, especially for older models with a glossy paint finish, and those with a crinkle style paint finish. You can actually use rubbing alcohol to clean the paint on many newer machines, especially those with plastic bodies, but just be careful and mindful either way. ​See our page on cleaning a typewriter for more information on how to go about cleaning your machine. ​If you don't really know what you're doing, then I don't recommend spending any more time going any further beyond the simple wipe-down I described above. Backstories help give your typewriter character, but do not include them if they are only rumors, and do not make anything up. If the typewriter has been in your family for decades, it's a cool fact to share with the buyer any information on who used it and what business or field it was used in (of course only if you are aware of this type of information and are willing to share). Other typewriters may have more interesting backstories. For example, I have a 1944 Olympia Robust typewriter which was produced in Germany for the Nazis during WWII. Basically explained, the typewriter was designed and made for use on the front by the Nazis. It comes with a heavy duty case (extremely heavy duty) and an SS key. You can see the "My Typewriter Collection" for more details and pictures. Anyways, this typewriter was captured and shipped home by an American Soldier, JL Nelson (name and army serial number painted on the bottom of the case), making for quite an interesting backstory. Unfortunately I never got in contact with the family that sold it, and JL and his wife passed away a few months before I got the typewriter from a local bid-board auction. But just imagine the potential how much more information could have been known about the machine. Obviously not every typewriter will have a great backstory, in fact most don't, but if you know anything at all from its history, share it with the buyer either in person, or in the description (depending on how you are selling it). I shouldn't have to say this, but just in case, please do not make anything up just to try to sell your typewriter for a few extra bucks. There's no point in exaggerating anything either. Again, just be honest with the buyer. It's up to you to decide whether you want to limit yourself to local sales, or if you are willing to pack and ship a typewriter to a buyer somewhere across the country. See How to Ship a Typewriter​ for what's involved with shipping. If you want to sell locally, craigslist is an excellent choice, however you aren't going to get a ton of eyes on your listing compared to eBay, where you have the option to only sell locally. However for both cases, you are still limited to local buyers instead of buyers from anywhere in the country. This is especially limiting for those in rural areas. You could also resort to auctions, garage sales, pawn shops, consignment stores, etc. however keep in mind that it's very likely you won't be getting a lot of money for your typewriter. If you are willing to ship and deal with eBay or similar platforms, you are likely going to get a fair amount of money for your machine as many collectors and other buyers looking for typewriters are competing for your typewriter if you choose to have an auction instead of a "buy it now" type listing. As a buyer, I check eBay relatively often myself. Overall, just know that many knowledgeable collectors/enthusiasts will be reviewing your listing and perhaps bidding, especially if you have a rare or desirable typewriter. Etsy is another option which is virtually the same, although I will personally say that I don't search through Etsy nearly as much as I do eBay. Alternatively, you can contact collectors or typewriter dealers/shops directly on if they are interested in buying your typewriter. Keep in mind that your typewriter will often be resold, so don't expect a crazy amount of money. I have purchased a few typewriters from those who have contacted me, and continue to do so every now and then. That all being said, if you need any help in finding the right home for your typewriter, or wish to potentially sell to Typewriters 101 directly, feel free to contact us!